Summer is a great time to get together with friends. In the south, one of the spaces most often called upon to entertain is the porch. Front, back, screened-in, or open air, these areas are a great way to take in balmy summer nights. Designing your porch to host truly amazing get-togethers requires some finesse. 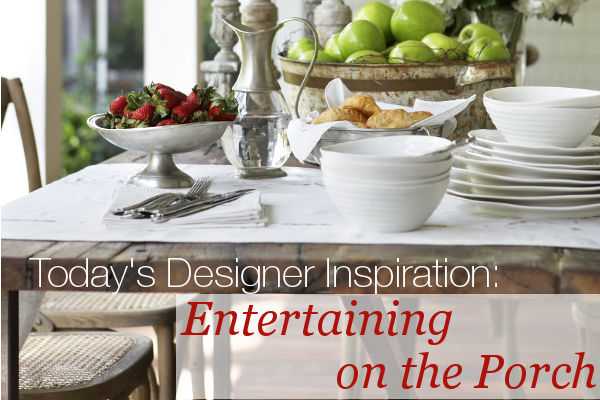 Here are some of our favorite porches for entertaining to use as inspiration for your designs. Sit and chat. The easiest way to make your porch design exceptional is to fill your space with simple, inviting seating. 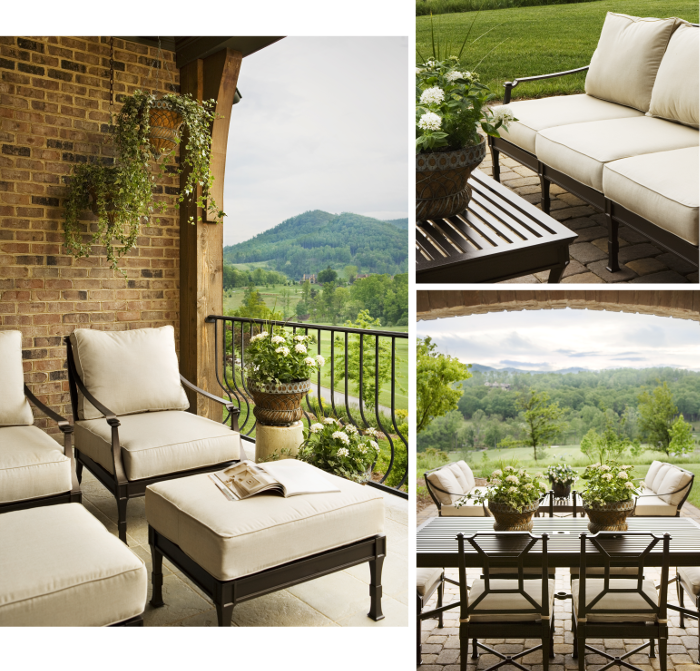 These iron framed couches and chairs have comfortable, neutral outdoor cushions. It is important to keep the chairs proportional to the size of the porch, leaving enough room to move through the space while also keeping the furniture grouped closely enough to hold engaging conversations.The chairs make this area a nice space to relax and catch up with old friends. Stop and smell the roses. One hallmark of a well designed porch is the inclusion of green space. The point of entertaining outdoors is to experience and enjoy nature, so don't forget to add a little to your design. Fortunately, a green thumb is not required to accomplish this. 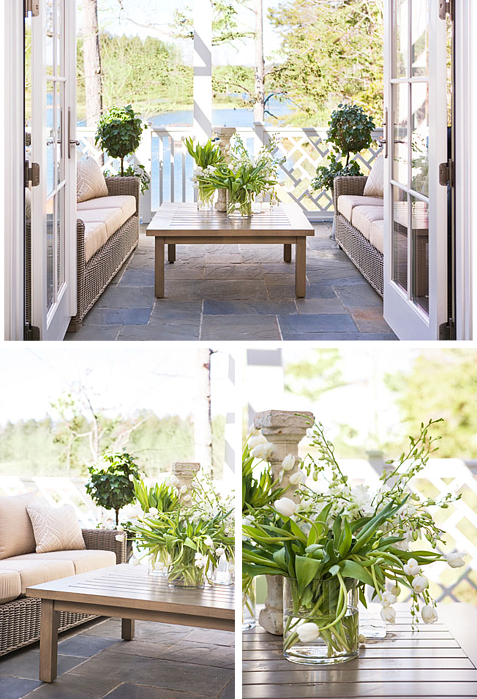 As you can see in the image below, a vase with fresh cut seasonal flowers can add visual detail and infuse a natural feeling to your porch without demanding real gardening skills. If growing things is your forte, choosing florals with nice fragrances or colors can aid the atmosphere of your parties. However, balance is key and the plants shouldn't overwhelm the space (or your guests). The greenery on these porches is simple and understated to allow other aspects of the design to share the spotlight. Grab a bite. What better way to bring people together than food? Give guests someplace to enjoy these snacks by investing in a large, high-quality table that will survive the outdoors and your party goers. A table of food can act as the focal point of your design - and it is much easier to catch up with old friends and move through a space if you don't have to carry your plate around with you. A centerpiece of fresh apples or a tray of strawberries can serve double duty as both an edible treat and as a colorful aspect of design. For your summer gatherings, a simple, classic appetizer to try is the cheese tray, featured below. Another thing to keep in mind when designing for an entertaining porch? Selecting stylish serving pieces for your get togethers can elevate the space. Elegant pieces like the water pitcher, oval footed shallow bowl, and even the flatware on this dinning table can make your gathering memorable. Indulge with drinks and dessert. 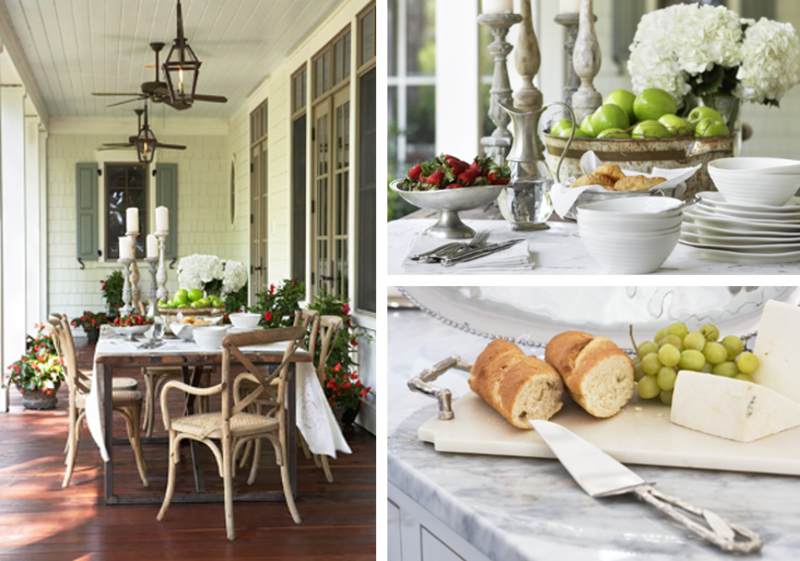 The finishing touch to a perfect southern-style porch get-together is the refreshments. There are a wide range of drinks and desserts to choose from to complement your unique party style. Remember to include a way to serve your desserts and beverages in your design process. A good bottle of wine is a bigger statement for your party when you serve it in wine glasses that reflect your design tastes and blend with the rest of the space. The same holds true for food, as you can see in the table below where we have a simple vanilla crème cake on a neutral yet visually interesting stand. The added flair transforms simple features into something remarkable. What design features are a must-have for your porch entertaining? It is fun to feature unique, interesting items in your design, but you don't want your decorations to overwhelm your party space. Click on the link below to get tips on keeping your decorations simple.